Cut thin slice from stem end of each bell pepper to remove top of pepper; discard. Remove seeds and membranes; rinse peppers. In 10-inch skillet, brown beef, onion and garlic over medium-high heat about 5 minutes, stirring occasionally, until beef is thoroughly cooked; drain. Stir in tomato sauce, cumin, salt, cinnamon and red pepper. Stir in couscous. Divide beef mixture evenly among peppers. Pour water into 4 1/2- to 6-quart slow cooker; stand peppers upright in cooker. Cover; cook on Low heat setting 3 to 4 1/2 hours or until peppers are tender. Garnish with pine nuts and cilantro. Vegetables offer a host of nutrients including vitamins A, C and folate to name a few. Be sure to get at least 3 to 5 servings of veggies daily. 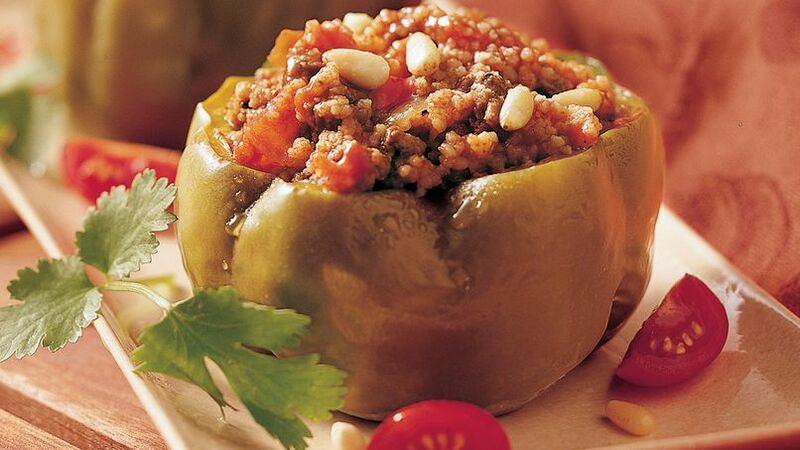 Like stuffed peppers? Try a new recipe with a spicy combination of ingredients.